Hyundai Expands Successful Diesel Capacity Lineup! With the huge success of the 7E Series, Hyundai is pleased to announce the addition of the new 250D-7E to the lineup. The 55,000 lb capacity diesel forklift is in a class by itself, incorporating the most standard features in the market today. Performance, ergonomics, serviceability and operator comfort were the most important enhancements considered when designing the 250D-7E in order to exceed customer requirements in today’s workplace. The Hyundai 250D-7E is equipped with a powerful Cummins QSC 8.3L engine, producing 260 HP@2,200 rpms which provide a travel speed of up to 25 mph. The durable ZF electronic shift transmission includes an automatic shift with 3 forward and 3 reverse speeds. Equipped with the combination of the QSC engine and ZF transmission, the Hyundai 250D-7E offers the most powerful performance in the market today. 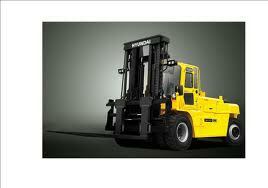 Hyundai has incorporated many of the standard amenities that our customers have come to expect from our forklifts. Password activated Engine Start Limit (ESL) intercepts fuel delivery to the engine without proper identification, eliminating equipment theft. According to load demand, Economic Mode and Power Mode can simply be selected, allowing the operator to select the level of power performance, which increases overall fuel efficiency. The 250D-7E includes a digital video monitor with enhanced features and benefits to increase accuracy and operator assurance when performing daily tasks. The Load Sensing Indicator displays the load capacity on the monitor and adjusts the hydraulic flow based on load demand. The Wheel Angle Indicator displays the position of the steer wheels throughout operation, assuring the operator of safe operation. The optional rear view camera works in conjunction with the digital monitor, allowing maximum vision of surrounding environments. The operator compartment is full of standard amenities to maximize operator comfort. The state of the art full suspension seat and the telescopic tilt column assembly allows any size operator to securely determine the most comfortable position. The 250D-7E includes an enclosed cab assembly with a CD/MP3 player and hands free remote control system that also includes a USB outlet for additional accessory usage. The optional Heater/AC system offers the largest capacity in its class.